Boric acid is a white powder or crystalline solid. · Boric acid is a white powder or crystalline solid. · Sodium tetraborate anhydrous is a light grey odourless solid. · Sodium tetraborate decahydrate and pentahydrate are white odourless, crystalline solids. · Borates have been used in a wide variety of pharma-ceutical preparations including medicated powders, skin lotions, mouthwash, toothpaste, and eyewash solutions. · Boric acid and borax are used in cosmetics and oral hygiene products. · Boric acid has been used as a preservative for urine samples. · Borates have been used as a home remedy for diaper rash and oral discomfort in infants. · Boric acid powder mixed with flour or sugar is used to kill ants and cockroaches in the home. Commercially available insecticides and herbicides used in the home may contain borates. · Borates are used in making heat-resistant glass, glazes, enamels, fire-resistant materials and agents, paints, photographic agents, and as insecticides and herbicides. · They are used to preserve wood, and also as flame retardants in wood and textiles. About 15 to 30 grams. · Absorption occurs through GI tract when ingested (though quite slowly), through lungs when inhaled (especially in the form of pentaborate gas), and possibly also through skin. · Serum and urine borate levels do not correlate well with the clinical state, though symptoms of toxicity generally occur only when blood levels exceed 100 to 150 mg/ml. GIT: nausea, vomiting (bluish green), haematemesis,diarrhoea (bluish green), epigastric pain. CNS: headache, tremor, convulsions, delirium, coma. Renal: oliguria, anuria, renal failure. Dermal: erythema, desquammation, and exfoliation (“boiled lobster syndrome”) (Fig 5.9). 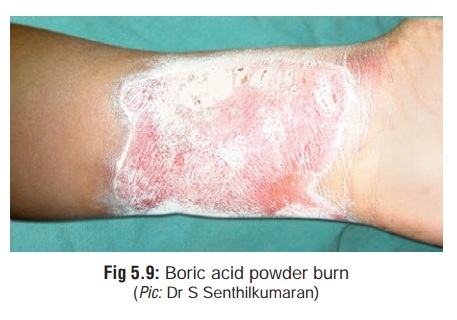 Usually seen in children who have been treated with a boric acid preparation for diaper rash. Apart from skin manifesta-tions, there may be oliguria, renal tubular necrosis, and renal failure. There may also be hypo- or hyperthermia, alopecia, and hypoplastic anaemia. Fatalities have been reported. · HCl is added to turmeric paper. Development of a brownish red colour is suggestive of boric acid or borates. · Blood borate levels may be useful to establish the diagnosis of borate intoxication. · Monitor renal function tests, cardiovascular status, fluid and electrolyte balance in symptomatic patients. · Induction of emesis or gastric lavage. Administration of a cathartic (e.g. magnesium sulfate). · Forced diuresis: Rule out renal damage. Urinary elimina-tion may be enhanced by administration of 0.45% saline in 5% dextrose in water IV, along with a diuretic (e.g. furosemide 1 mg/kg, upto 40 mg/dose). Urine flow should be maintained between 3 to 6 ml/kg/hour.Peritoneal or haemodialysis. · Supportive measures: Correction of shock, convulsions,etc. · Skin exposure must be treated by washing the affected area several times with soap and water. Eye contact is treated by irrigation with water for at least 20 minutes. Ophthalmological consultation may be required. · Gastric mucosa is often bright red in colour. Blood may have the cherry red colour commonly associated with carbon monoxide poisoning. · Characteristic skin lesions (boiled lobster syndrome) may be present. · It is advisable to include one cerebral hemisphere for chem-ical analysis apart from the routine viscera, since the poison is often concentrated in the brain. Almost all the reported cases have been accidental or iatrogenic in nature.